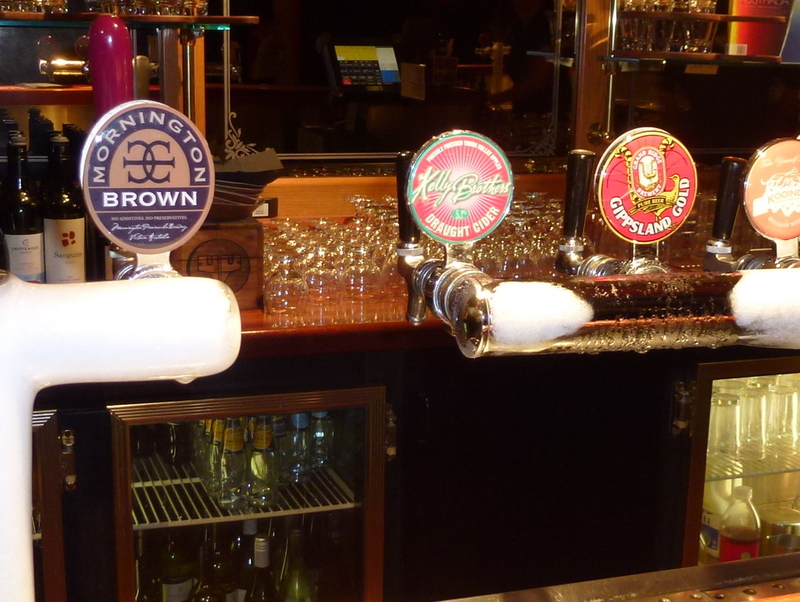 My experiences of pubs and bottle shops in Melbourne and Sydney have certainly whetted my appetite for a return visit. But they also opened my eyes to a parallel but even less explored phenomenon: the even newer vogue for alcoholic cider and even its pear equivalent, perry. 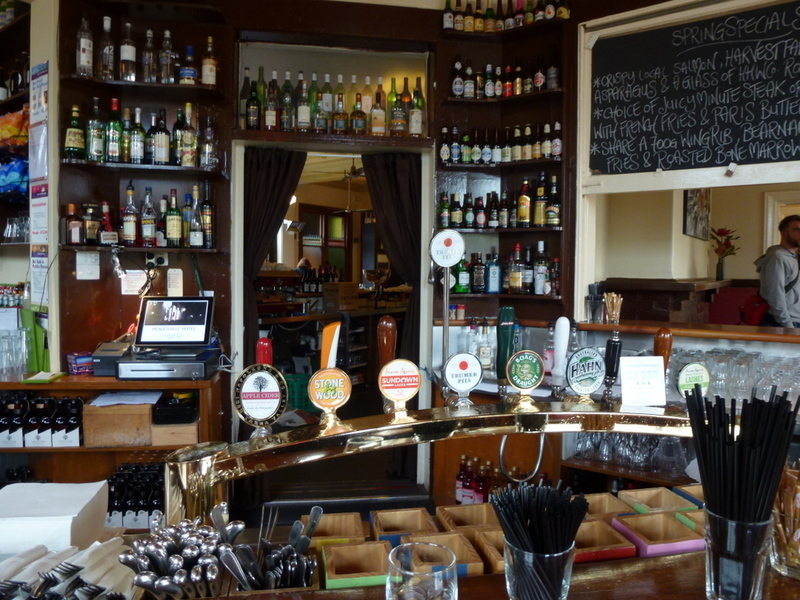 Many of the establishments I visited during my 10 day stay in the country had at least one cider on sale, often on draught, with unthreatening imports such as Ireland’s Magners and Sweden’s Rekorderlig being extremely widespread. Of greater interest, several of the products available came from native producers. With little knowledge about or expectations of Australian cider I was keen to try a couple. 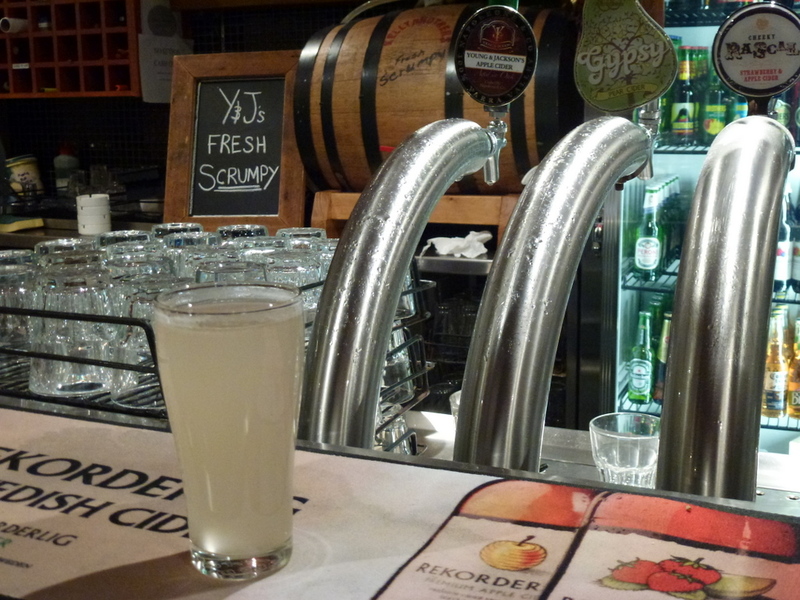 My first exposure was to Kelly Brothers Cider’s Sparkling Cider (7%) from the Yarra Valley east of Melbourne, which I’d noted in a couple of establishments before I tried it for myself at Mrs. Parma’s. The very pale yellow, sparkling, medium-sweet liquid was undoubtedly “cidery” but nevertheless rather unfamiliar to a palate more used to often highly characterful English and Welsh ciders. Quite drinkable, and a definite improvement on the most common imports, but not perhaps to my taste. Scrumpy? Or a glass of pastis..? Which is, regrettably, more than I could say of the decidedly strange concoction sampled at Young & Jackson’s new roof top cider bar. Touted as Y&J’s Fresh Scrumpy (also made by Kelly Brothers) and served from an oak barrel on the back of the bar the unfiltered, cloudy but otherwise almost colourless liquid defied description. Apparently “Made with a sweet blend of Jazz Apples” Y&J”s Fresh Scrumpy offering a fruity, sweet, somewhat sherbety palate with little obvious resemblance to cider as I’ve previously known it. Although it certainly deserves points for effort. While it’s clearly unreasonable to criticize Australian cider on the basis of two samples from the same cider maker, I’m not surprised by what I did experience. The kinds of apple best suited to a well-structured cider are not common outside of the traditional cider-making regions of Europe. And without a longstanding culture of cider making they simply aren’t cultivated as they’re not much use for anything else except feeding to pigs. Australia currently lacks both. But maybe I’m missing the point. After all, with eight draught ciders, many more bottled varieties and an enthusiastic crowd of young people at the bar, Young and Jackson is to be applauded for providing cider and perry a showcase as well as creating impetus for cider makers to up their game. My bet is it won’t remain the only specialist cider bar in the country for long. Nor would I bet against Australia’s new found enthusiasm for brewing and cider making ultimately making itself felt on the world stage. After all, the country has already done the exact thing with that other great fermented drink, wine. From literally a sticky start in the 1970s – when sweet wines and port- and sherry-style fortifieds were the key products of most commercial wineries – the country has drastically reinvented its own wine industry. Moreover, it has contributed enormously to a heightened global interest in the subject, kickstarting (along with west coast USA) a demand for fresh, fruity and vibrant wines. Australian wines are now so popular in the UK that they outsell their French counterparts, a situation once unthinkable. I stated in my first post that wine isn’t really my thing (I even suggested I probably wouldn’t be writing about it) but I’d have been daft to turn down the opportunity to sample a few varieties at source when it was presented to me on a plate. A day out in the Dandenong Ranges and the Yarra Valley with Tim and his missus led to just such an opportunity. For once, drinks wise, I was merely along for the ride and a very pleasant ride it turned out to be. 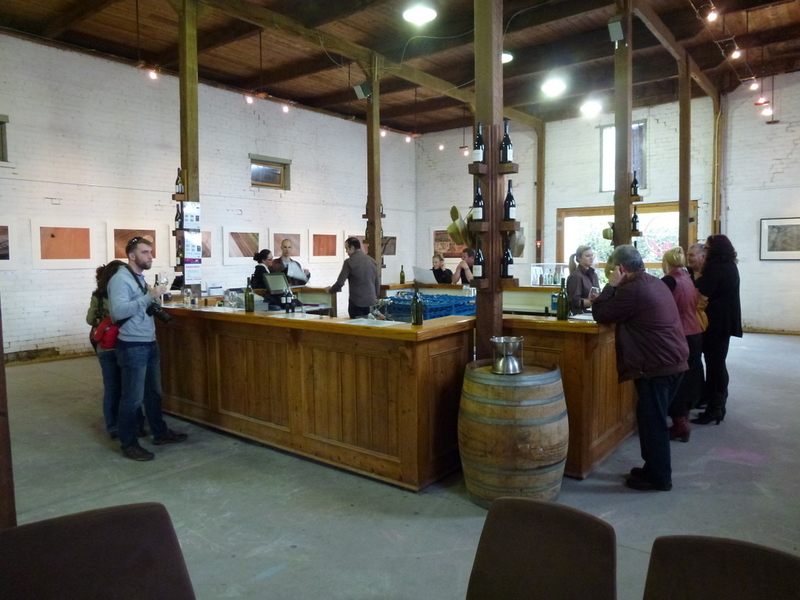 Yering Station near Yarra Glen to the east of Melbourne, like many other wineries in the region and across the country, welcomes visitors with an opportunity to sample a selection of its wares for free in the expectation that they’ll buy at least a bottle at full price to take home. The setting is also an extremely attractive one. The expansive tasting room and well-appointed farm shop in the original 1859 winery building contrast with and complement a purpose-built modernist restaurant with huge glass windows overlooking the rolling expanses (exceptionally green at the time of our visit) of the Yarra Valley. The site also appears to be a centre for local art and artists. 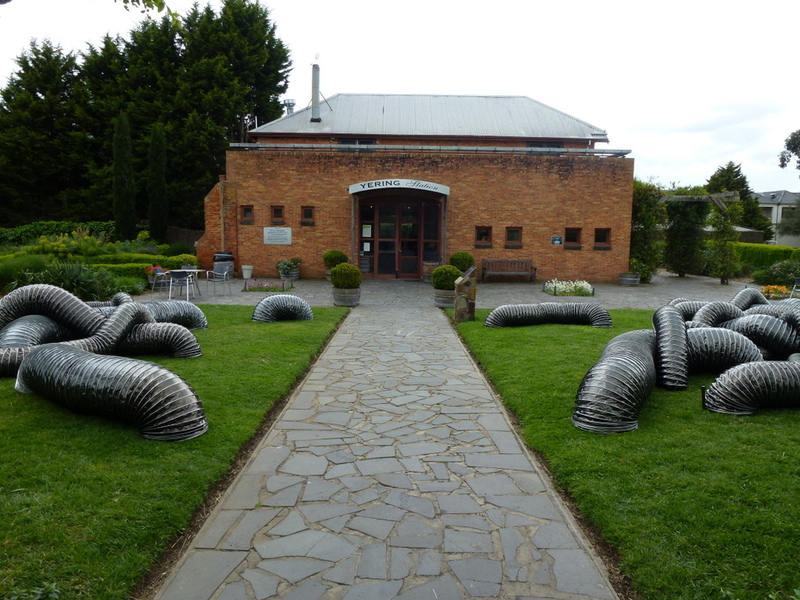 The laid-back tasting room acts as an art gallery while various outdoor exhibits were being erected when we visited (check out the giant tunnelling “worms” inspired by the local giant earthworms). The winery also has some natty sculptures of its own dotted around the site. My companions seemed shocked that my beer-attuned palate could be put to useful effect in tasting wine and I have to say I was somewhat surprised myself how perceptive my taste buds could be under these conditions. Leaving Yering Station we headed for Hargreaves Hill Brewery, just up the road in Yarra Glen, for a late lunch but arrived just too late to order (at least I managed to try some of their brews elsewhere). In desperate need of food (and a beer) we settled instead on the classic Healesville Hotel in nearby Healesville and were treated to an excellent sirloin steak (nowhere does steak like Australia, sorry USA!) and a decent selection of ales and lagers. My own choice, Trumer Pils (4.9%), was actually from the USA via Austria and was a very decent example of a soft (unpasteurised?) but well-hopped Pilsner. There was a lot worth reporting from my trip down under. But there’s also an awful lot more to discover for the discerning tippler and, what’s more, plenty more to come I’m sure. Here’s to next time!